Mannheim, 7 June 2018. Röchling SE & Co. KG (Mannheim) can look back on a strong 2017 financial year. With a sales increase of 11.1 percent to EUR 1,840.9 million (previous year: EUR 1,657.4 million), the Group reported its eighth consecutive sales upturn. Demand eased somewhat in the first quarter of 2018. At EUR 477.5 million, sales for the quarter therefore were only just up year on year (EUR 474.6 million), with exchange rate effects cited as the greatest negative influencing factor. Prof. Hanns-Peter Knaebel, Chairman of the Executive Board of the Röchling Group, states: “The start to the new 2018 financial year did not fully meet expectations. For the financial year as a whole, we continue to see every possibility of achieving our ambitious targets across virtually all areas. Essential to this are our materials expertise in the dynamic market for high-tech plastics and our application knowledge. In the 2017 financial year, Röchling benefited from favorable demand in virtually all industries. “The economically favorable circumstances as regards orders received, our innovations and the absolute focus seen on customer benefits were the growth drivers,” stated Prof. Hanns-Peter Knaebel. “Over the coming years too, I see every chance of driving forward our expansion organically and through acquisitions in all three corporate divisions.” Sustainable growth is Röchling’s concern in this regard. This includes continual efforts in assessing the environmental implications of the company’s activities. Most Röchling sites are certified according to environmental management standard ISO 14001. Röchling has also introduced voluntary environmental standards and monitors compliance with these meticulously. Staff numbers increased in the 2017 financial year by 10.4 percent to 9,733 (as of the reporting date of 31 December 2017). The Röchling Group has a global presence at 88 locations worldwide: 55 in Europa, 18 in Asia and 15 in the Americas. The Röchling Group had 255 trainees and apprentices for the reporting period (previous year: 229). Opportunities range from commercial and technical training-based occupations through to various dual university-level courses. Of Group sales, Germany accounted for 39%, while the rest of Europe contributed 31%. The share of sales coming from the Americas was 20%, with 10% coming from Asia. Earnings before taxes (EBT) increased by EUR 9.1 million. This put the EBT margin at 7.3% (previous year: 7.64%). Innovation again proved a leading driver of growth. An increase of 41.3 percent to EUR 178.7 million was recorded. Focus was on expanding and modernizing global capacities. Röchling recorded pleasing sales trends across all regions. The acquisition of Fischer GmbH Kunststoff Präzision (Laupheim), a leading machining specialist of precision plastic parts and components, also spurred on growth. The company rebranded into Röchling Industrial Laupheim GmbH at the start of the year. Further investment funds were channeled into expanding operation and production facilities at the Haren site, into new production and logistics space in Thal, Bad Grönenbach, and into a new logistics hall in Lahnstein. Investments overall in the Industrial division amounted to EUR 40.7 million. The division demonstrated its plastics mastery through participation in a project at the highest level in 2017. With inclination rings produced from Durostone® EPX-M for transformers, Röchling collaborated in constructing the world’s highest-capacity line carrying high-tension direct current in China. The line runs over 3,284 kilometers from Changji to Guquan. A shipping company from Haren was behind the world’s first container ship, the Wes Amelie, to be converted over to a modern and environmentally friendly liquefied gas drive system (LNG). Stays made from Lignostone® cryogenic by Röchling take on a supporting role in this project. Synthetic resin compressed wood insulates the -164°C fuel tank reliably from the ship’s structure. Key innovations also included the development of permanently antistatic sliding materials, for the first time proving suitable without the use of carbon black, allowing for their production in various colors. LubX® CV AST color and LubX® AST color applications include conveyor systems, in particular for fragile goods in transit, e.g. in food and pharmaceutical industry settings where both high standards of cleanliness and antistatic properties are required. Any abrasion of carbon black particles must be excluded in such applications. The 30-year anniversary of Röchling Engineering Plastics in Dallas/North Carolina points celebrates the company’s many years of expertise in the development of superior industrial plastics. The company is strengthening its manufacturing and sales presence in North America and has recorded continual growth since its founding in 1987. The Automotive division achieved a sales increase of 15.8 percent in 2017. This equates to an increase from EUR 855.9 million in 2016 to EUR 991.5 million in the reporting year. Virtually all regions benefited from the upward trend. Röchling achieved noticeable growth particularly in Europe. Commercial operations were also positive in Asia and Brazil. Revenues edged down somewhat only in North America. Due to the market slow-down in the automotive area, not all orders were released by customers. Frustrating matters further, customer difficulties in launching a model and negative currency effects also impacted. “We have been quick to implement our growth strategy in the Automotive division,” states Erwin Doll, the member of the Management Board in charge of the Automotive division. Investment has been focused on the new construction or development of production facilities. Röchling for instance has invested heavily in its sites in Ostrava, Czech Republic, Duncan, USA and Silao, Mexico. In Teruel, Spain, a new factory has been built for wheel arch linings and deflectors for Ford. Alongside the Araia site, it becomes the company’s second factory on the Iberian Peninsula. A new production facility was also opened in Shenyang, China. New technical centers for global product development were established at the sites in Worms, Germany and Laives, Italy. A new production hall was invested in at the site in Peine at the start of the year. All together, the division increased spending to EUR 105.3 million from EUR 75.4 million the previous year. From 2019, Röchling will manufacture wheel arch linings in Akron, USA for electric vehicles start-up Lucid Motors based in Mountain View, California. In China, Röchling is developing plastic parts for start-up Nio based in Shanghai for two of its electric vehicle models scheduled to enter production in 2018. Further new customers acquired by Röchling include Chinese start-up CHJ Automotive. 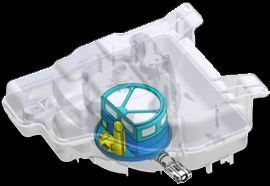 As well as active grille shutter controls, expansion tanks are also being used in a seven-seater hybrid SUV. Luxury vehicle manufacturer FAW-Hongqi was also acquired as a new customer in the highly contested Chinese market. Two models will be fitted in future with underfloor panels from Röchling. The division has reported pleasing demand from China. Shanghai General Motors (SGM) for instance has ordered active grille shutters for the Buick Regal. Röchling will deliver active grille shutter systems for FAW Group Corporation’s small SUV from December of this year. Further active grille shutter systems are being manufactured by the company for the Shanghai Automotive Industry Corporation (SAIC). The area of application is a new electric vehicle. Volvo Asia’s electric high-end Polestar model now also uses Röchling grille shutters worldwide. The Automotive division will start producing just under 40,000 low-pressure systems a year for SAIC Maxus Automotive, a manufacturer of light commercial vehicles, from next year. In Europe, the new Opel/Vauxhall Astra will be manufactured with active grille shutter controls and fully paneled underbody. Volkswagen has ordered heated SCR tanks for its Caddy models. The year’s special occasions included 10-year anniversary celebrations at the company’s manufacturing site in Kunshan in China. Further high points last year included participation in top-class roadshows of leading Chinese automotive manufacturers. Representatives of Röchling Automotive showcased the company’s innovations and system solutions at the events. Groups Dongfeng Automobile and Beijing Electric Vehicle among others had also invited along a BAIC Group company. The group also maintains good ties with South Korea. Representatives of Röchling Automotive demonstrated to the South Korean Minister for Trade, Industry and Energy, Paik Ungyu, on his European visit, the commitment and dedication of the Röchling Group in his home country. Of particular interest to the minister was the planned opening of the first factory in Asan/South Korea. At EUR 114.4 million, sales in the Medical division were virtually on a par with the previous year’s level (EUR 117.2 million) in line with expectations. Decisive for the downturn was the production shift of a major US customer. The acquisition of new orders, however, virtually made up for the losses. Business furthermore was also hit by unfavorable foreign exchange rates. EUR 32.1 million. Investment focused on constructing a new production facility in Neuhaus am Rennweg/Thüringen, housing the manufacture of primary packaging for pharmaceutical products under ultra-modern Class GMP C and Class GMP D (GMP = Good Manufacturing Practice) clean room conditions. Investment was also made in Brensbach/Odenwald in extending a production building. Sympfiny®, a system for administering multi-particulate drugs specifically for children, was among the division’s most ambitious products of 2017. The drugs, which come in the form of small spheres, are coated with a taste-neutralizing layer. Röchling produces the system in collaboration with HS Design. It ensures simple and reliable administration and precise dosage. Röchling in the US also develops and manufactures parts for modern surgical instruments for minimally invasive surgery. Products involve sophisticated components and parts in tight tolerances with high surface quality. After a patchy start to the current 2018 financial year, Röchling once again sees every possibility of continuing sustainable growth organically and through acquisitions for the year overall. Partner-based cooperation with our existing and newly acquired customers - won over by Röchling’s product and service expertise - creates interesting growth prospects for the Röchling Group for 2018 and beyond. Alongside digitalization, however, instilling the right skills in staff is also key to ensuring the company is fit for the future. This reflects the fact that well-trained, creative and motivated staff are an essential factor with respect to the company’s economic success. The Röchling Group increased investment in 2017 in its skills and advance training measures for staff and offers its personnel professional prospects, personal development and structured career opportunities. The water injection technology for gasoline engines is an attractive prospect thanks to the significant fuel savings that it offers, thereby reducing CO2 emissions and increasing performance. At Röchling Medical, products are manufactured, assembled and packed in cleanroom conditions classified according to C+D/ISO 7+8.